Leonard Bernstein is quoted as saying, “Music can name the unnameable and communicate the unknowable." We tend to agree, and that's why we're excited to share some of the musical performances and events that you can find locally on or near Florida's Gulf Coast beaches. How about some bluegrass? We have it here. 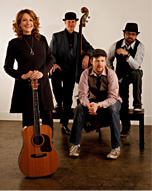 Bluegrass artist Claire Lynch and her band return to Hough Hall in the Palladium Theater at St. Petersburg College on Friday, November 16 at 7:30p.m. Lynch, formerly associated with the Front Porch String Band, is praised for being a talented performer as well as a captivating singer and songwriter. She and her band are on the Rounder Records label. Tickets are $20 and can be purchased here. Do you have an affinity for jazz? This might be the perfect weekend for you to be in Clearwater, Florida. On Friday, November 16 through Sunday, November 18 you can find a jam-packed schedule of jazz performers during the 22nd Annual Suncoast Jazz Classic held in venues throughout the Sheraton Sand Key and Marriott Sand Key resorts on Clearwater Beach. There are a wide variety of admission choices, so you can choose the one that best suits your needs. They offer everything from daily badges and student passes to weekend badges, four-day badges, and more. The Suncoast Jazz Classic ticketing information and pricing can be found on the event website. Come on out to England Brother Park located in Pinellas Park to hear a blast from the past by American English as they pay tribute to The Beatles. Voted "Best Tribute Band" and quoted by Newsweek in 2012 as "Best Beatle Band on the Planet," the performances are sure to please. Enjoy classics from the early years including hits like "I Want to Hold Your Hand," "Twist and Shout," and many more. The American English Beatles Tribute is held on Saturday, November 17 with show time beginning at 8p.m. John, Paul, George, and Ringo are hoping to see you there. General admission is $9.99 for lawn seating and prices run up to $24.99 for orchestra-front seating. Ticketing information can be found at www.ticketfly.com or www.soundstagelive.net. In addition to the great musical events, the Masters Cup Sandsculpting Competition and Music Festival is happening this week at Bilmar Beach Resort November 15-18. Landshark presents the 3-day free festival of fun and live music where you'll see a host of Sanding Ovations. Also this weekend is the 20th Anniversary Downtown Dunedin Craft Festival on November 17-18 from 10a.m. to 5p.m. Admission to this event is also free! With plenty to do, all you need now is a great place to stay. Vacationers can find a nice selection of beach vacation rentals close to the Gulf Coast beaches with fantastic amenities to choose from. It's never too early to start planning your next beach vacation. Have you been to any of the local music festivals or performances? If so, we'd love to hear about it. Drop us a line in our comment section. Cheers to good music! Really very interesting post.Thanks for sharing.